Pretty easy really. From Arncliffe village, walk up the Monk’s Road footpath, heading for the rocky mass immediately south. Once you get onto the moor edge, veer straight up to your right and keep walking till you hit the rocks. Look around! Although the sites is generally ascribed as Iron Age to Romano-British in date, it seems evident that these buildings were used in much later centuries — perhaps until late medieval periods. Other remains of similar size and stature can be found scattered on the hills near here (I’ll add them on TNA at sometime in the future). 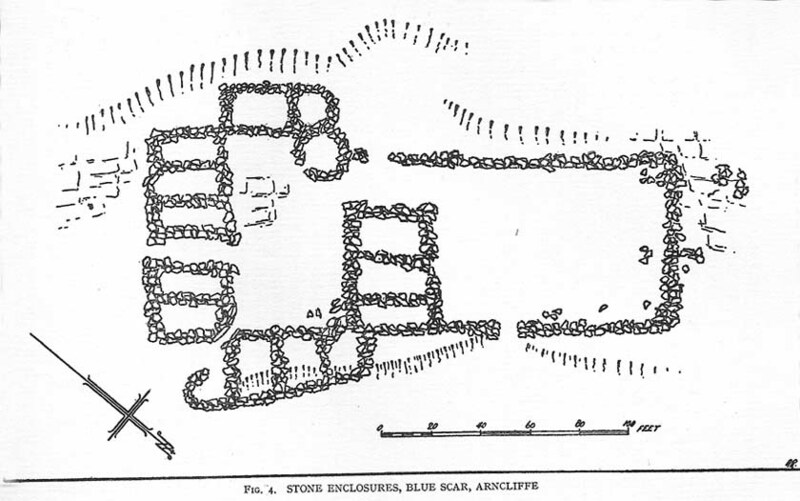 Charlesworth, D., ‘Iron Age Settlements and Field Systems,’ in Proceedings of the Archaeological Journal, 125: 1968. This entry was posted in Brigantia (Northern England), Settlement/Enclosures, Yorkshire, North and tagged antiquities, Archaeology, Arncliffe, enclosures, Hawkswick, Iron Age, Littondale, Malham, North Yorkshire, prehistoric sites, Romano-British, settlements, Wharfedale. Bookmark the permalink.